Last week I was able to enjoy the luxury of being a student again with no interruptions, distractions, phone calls etc. Being able to work in a studio from 9 in the morning til 9 at night, although exhausting is also wonderful. I forget how much you can do without the interruptions of daily life. I took a weeklong workshop with Kerr Grabowski on deconstructive screenprinting. I knew it would be fun but surprised myself at how much I truly loved the technique. The surface design studio at John C. Campbell is great, so big and spacious and another plus - they keep the classroom enrollment low so each person has lots of room to work and move around - only 8 in this class. Great lighting, lots of windows and all kinds of equipment including a washer and dryer! And the view - being able to see beautiful mountains as you work is just the best! or things from the childrens aisle such as little crowns with jewels. Popped bubble wrap and the orange fencing found at construction sites work wonderful. After creating a textured area for under the screen, you apply thickened mx dyes to the screen. Use a squeegee and watch the texture emerge as the dye catches in and around the nooks and crannies of the textured surface underneath. Allow the screen to dry; on hot days, this doesn't take very long. You then place the screen over the fabric which has been soaked in soda ash and then dried. The fabric can be white or have a small pattern. Using a thickened print paste mix which has alginate in it, you squeegee over the dried screen. The print paste loosens the dye which prints on the fabric. But here is the cool part, since there are varying degrees of thickness in the dried dye, each print has a different look depending on how much dye is released. You never know what you're going to get. Here is Kerr demonstrating a simple print - you can get many prints from the one screen. She went back and added a little more color into the third print using thickened dye. She applied it using a paint brush. Here are some of the ones I did. These are both from the same screen. You can see the changes in each print as the amount of dye released changes. There were some wonderful big leaves out back which we all had to try; I really liked the leaf prints. I had some rusted fabric with me I wanted to experiment with and used a very subtle color - stormy grey to print on top. I prepared the screen by using torn strips of newspaper underneath which served as a resist and prevented the dye from printing in that area. I liked the rust more than I thought I would and hope to do some more. This is such a fun technique. Kerr has an excellent DVD (3 1/2 hours) that gives you very detailed instructions on how to do this. Go to her website for further information. Lots more stuff to show and share so Until next time - Happy Creating! I've been rusting fabric - mostly the mercerized cotton from Test Fabric which takes any kind of color beautifully. This piece was done with the intent of bringing it to a workshop I'm taking next week where we'll be working with dyes. To rust it, I placed it on top of a piece of "already dyed" fabric, knowing the other would bleed as it wasn't rinsed enough initially. I wanted the shadow of another color to appear along with the rust. So I'll have 2 of these rust pieces to play with next week. I tried to limit the amount of rust on this one as I'll be doing "desconstructive screenprinting" on top. Sometimes I don't know when to stop; this is probably a little overdone for what I want to do with it. This is a piece of fabric already dyed which I rusted - the one I placed alongside the white knowing it would bleed onto it. It's hard to know what colors will work well with rust. This next piece was dyed a "Marine blue"and then rusted. It's more subtle but I like it. I rusted the fabric and then overdyed. When using the mx dyes, I prefer that order in the process - rust, then dye; when using acid dyes which involve boiling, I like to dye first and then rust. I think the boiling can disturb the rust and tone it down too much. This next piece was my favorite, a mercerized cotton, rusted and then overdyed with mx olive in low water immersion in a very small container - lots of "scrunching" which results in so many lighter areas. The rusted objects don't always touch the fabric completely, sometimes just the outer rim of the object and you get "lines" and "shapes". There's no way to know what's going to happen though - just a big surprise. Until next time, have fun playing - inside and away from the heat! Fall is just around the corner and my fall decorations are on the edge of our storage closet, waiting to emerge and take their place downstairs until they are replaced by Christmas decorations. Well, when you read the title, did you think this post was about me - not so, but probably not far from the truth. 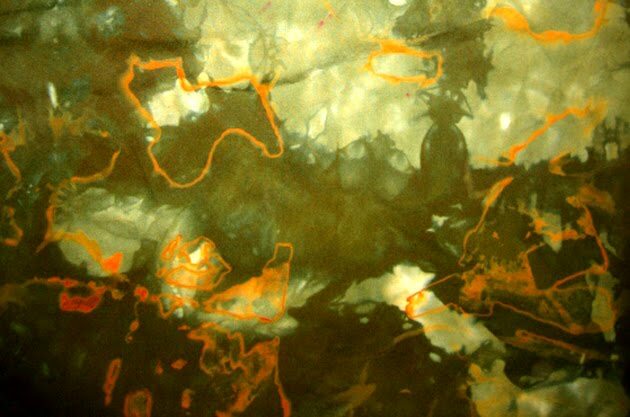 But it's about my rusting adventures - fabric - both dress goods, quilts and also silk scarves. I use this wonderful big tray. Years ago I was lucky enough to get 10 of this huge trays from a Dominos Pizza close by. At the time, I used them for marbling workshops - they're large and shallow and good for many things. Dominos used them as a dough tray - now they make perfect rusting trays. I have been collecting rusty old things in a variety of shapes. I also look for "flat" things as they're easier to work with. I soak the fabric in a white vinegar solution. I don't have an exact recipe but it's around 2 gallons of water to 2 cups of white vinegar. I soak everything for around 15 minutes - enough time for the solution to permeate the fabric. I wring the fabric ever so slightly; it's really quite "drippy" when I put it in the tray. My fabrics are not lying real flat. I think the little pleats and wrinkles add some interest when you rust over them. I then lay the rust objects over the top, no plan - just whatever happens, happens. I sprinkle it with a little more vinegar/water solution and then loosely cover it with plastic. I leave it around 24 hours. And then comes the most fun part - removing the rust to see the wonderful patterning. I've experimented with dyeing first and then rusting OR rusting and then overdyeing. I prefer to dye the scarf or fabric first to see what color I have to work with. This is a very pale piece which took the rusting very well. All the scarves are dyed with an acid dye. I like to work with 3 different silks - a crepe, a China and a chiffon; they all give different results. I think the patterning is so interesting; you never know what you're going to get which makes it fun! The NC Arboretum in Asheville will be carrying them in their gift shop; it's nice to have an outlet for them. Today I've been playing with mercerized white cotton and will share results soon. Until next time - Keep playing! My new little "great-nephew" is almost 2 months old and I finally finished his quilt. I just put the finishing touches on the binding and label, my most unfavorite part - but it's DONE and ready to send off to its new home in Florida. It will be a while before Max can drag it around, find things on it and just have it be his "binky". I know he'll enjoy it; little ones love bright colors and "I Spy" things to find. or this one - "We love Max". "Max is cool" is probably pushing it for a baby but I know he'll be very cool some day! I use very short descriptive words so they'll fit in the space and always hope for a short baby name - Max - now that's perfect. I also send a "list" of quilt phrases stitched in the quilt for mommies and daddies to find. It's called "Find the phrases" - 22 in this quilt and if they find them all, they get BIG kisses from Max! Welcome to the World Max, and Until next time. The Asheville Quilt Guild held its annual show at the NC Arboretum in Asheville this past weekend. As always, it was a lovely show and made even nicer by the beautiful surroundings of the NC Arboretum. An attendee to the show not only sees the quilt show but can take advantage of the beautiful, extensive gardens including one of the largest Bonsai exhibits, other arboretum exhibits, gift shops and quilt show vendors. All in all it's a full and wonderful day! One of the most fun quilts at the show was the one made for the 75th anniversary of the Blue Ridge Parkway to hang in the new headquarters in Asheville, NC. A number of well known local fiber artists were asked to make blocks depicting their favorite thing about the parkway. Following are some highlights of the Blue Ridge Parkway quilt. There were many wonderful quilts to see, here are just a few. I didn't get the names of the quilts but did get the artist. Judy Heyward created this wonderful quilt, up close - it's an amazing piece of work. The gold background is quilted with stitches so close together, hard to believe. I know Judy won several well deserved awards including machine quilting. Congratulations Judy! This next quilt by Christine Regina was one of my favorites at the Shady Ladies annual quilt show in June. It utilizes lots and lots of polka dots, beautifully done and just brings a smile to your face. My friend Eve Agee who is a master at machine embroidery did this next lovely piece - everything you see is machine embroidered! I've always loved the pink and green combination and when I learned it was my quilting buddy Trish Gabriel that did this, I was even more excited! Trish does big quilts. This one is really big and beautifully done and wonderful color/fabric choices. Veronica Von Zwehl did this next piece. Veronica does all the birch trees I've featured on my blog and also a member of the very talented group - Shady Ladies. Veronica makes beads out of fabric which are the little narrow vessels on the quilt; there's lots of dimension as well as great color. I love Gingko leaves and this next piece was beautiful by artist Terry Williams - great color and stitching on the piece. I really liked this next piece by Elizabeth Allen. I often work in neutrals so this appealed to me. Jane Cole another favorite artist of mine, did this wonderful piece which captured a second place in the small pieced catagory. This next piece by Carrie Hedstrom won one of the Judges Choice awards, it was wonderful - beautiful color and love the border. I'm honored to say, I won the other Judges Choice award. And Ta-Da, this was the best of show - a miniature by Mary Kay Mouton, exquisitely done and nice to see something small take it all! Patty Ashworth did this interesting piece. And another Ta-Da - this last piece by a new "star is born" Sadie Bowen" This precious little girl is the granddaughter of Wendy Bowen who is wonderful in her own right. Wendy's been teaching Sadie who's only 10 years old. We all think Wendy's "done a good job". Sadie has very definite ideas about where she wants to go with her quilts, does all the sewing and designing herself. Better keep an eye out for her. She's precious, adorable, and really, really good.